For a great project idea that's fun and educational, why not make your own comic book with your child? Comic books can be full of laughs, adventure, and even drama, and if you make your own comic book with your child, you can open up a world of creativity through the stories you both tell. The history of comics can be traced back for several generations, and the passage of time has brought many changes in the comic book genre. While comics were originally meant to entertain in a humorous manner, they eventually broadened their focus to include superheroes and story lines that are more dramatic. One of the best things about comic books is that they are universally appealing, and fans of comic books range from kids to senior citizens. Why should you encourage your kids to create comic books? Learning activities: There are many educational opportunities to be found in the creation of comic books. They are an easy way to encourage kids to tell a story, and they foster a love of reading. Fostering creativity: When you help a child make a comic book, you foster her creativity. As she draws and colors her pictures and designs the layout of the comics, she'll become more adept and more confident in her ability to create. With younger children, the key to creating a successful comic book is to keep it short and simple. Most children do better if they have a visual they can look at. Since you may not have a simple enough comic strip on hand, you'll probably need to create one that your child can use as a model. To create a younger child's comic book, you'll only need to make two or three slides per page. Use a ruler to draw several frames, and then show your child how to fill in the frames with figures and objects. 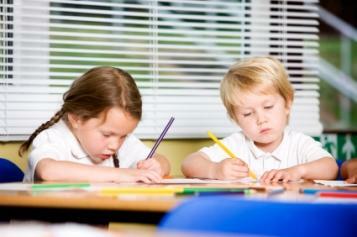 Next, help your child verbally develop his story so that he has an idea of what kind of pictures he wants to draw. You might want to draw a few of the characters of his story for him, so that he can copy them later. You're now ready to connect your frames or strips by either stapling the pages together or punching holes in one side, and tying the pages together with yarn or string. If the comics were drawn on paper, glue or tape them to cardstock to make them sturdier. Older children and teens can get in on the comic book act as well. Have them create their storylines before they start actually making the book. Older kids will probably want to fit anywhere from four to eight frames per page. Once they've drawn all of the characters and added features, they should add color to each frame, even outlining them in contrasting shades as well. Comic Book Project-Kids of all ages can find inspiration at this site. Read Write Think-Creating a comic strip is easy with this online comic creator. Enchanted Learning-This is another great site that lets kids get creative online.